With January comes fashion’s fanfare announcing the imminent arrival of a warmer season, as brands begin to launch their S/S18 collections, and with them, the accompanying campaigns. Conceived by some of the most brilliant creative minds in the industry, these never fail to set the tone for the months ahead. Here we outline nine of the best, from Jamie Hawkesworth’s golden-hued shots for Marni, to Ignasi Monreal’s digital paintings for Gucci. “It’s almost like a bizarre cocktail of objects that have rained down on her. 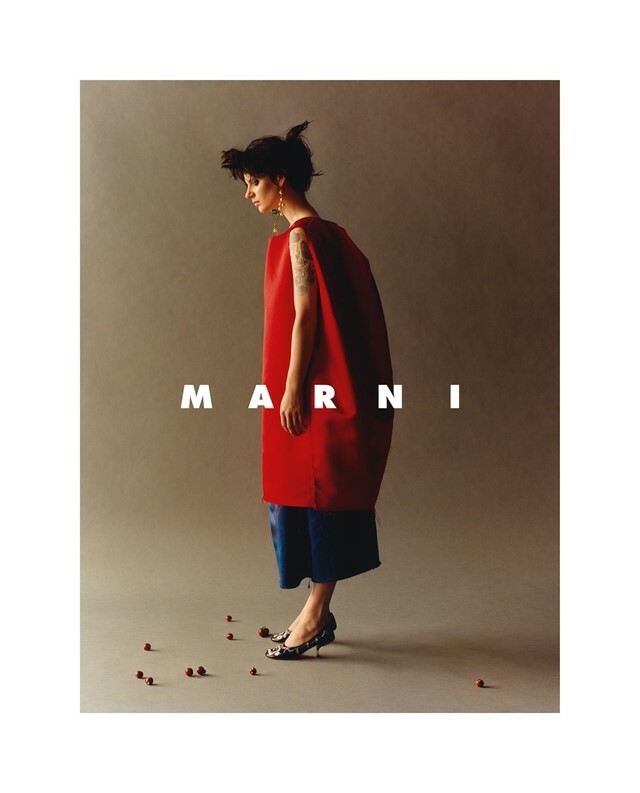 She’s like an archaeologist who’s scavenging into a trunk full of objects, dreams, stories, life,” Marni’s creative director Francesco Risso said of his second collection for the brand, which introduced a cacophony of chintzy patterns and fabrics, as though sourced from a sophisticated dressing up box. The subsequent campaign, shot by Jamie Hawkesworth and styled by Camilla Nickerson, distills the essence of the S/S18 Marni woman, with Hawkesworth’s signature golden tones lending themselves to the jewel-coloured garments and quaint still lifes in equal measure. Kaia Gerber was dubbed the face of S/S18, making her runway debut wearing Raf Simons’ second Calvin Klein collection and setting the tone for the rest of the season. Naturally, it makes sense that Gerber features in the latest campaign by Willy Vanderperre, alongside her brother Presley. Captioned ‘Our Youth’, the images of Gerber possess a similar feel to the 1980s denim campaigns featuring Brooke Shields, albeit with a definitive Simons and Vanderperre edge. 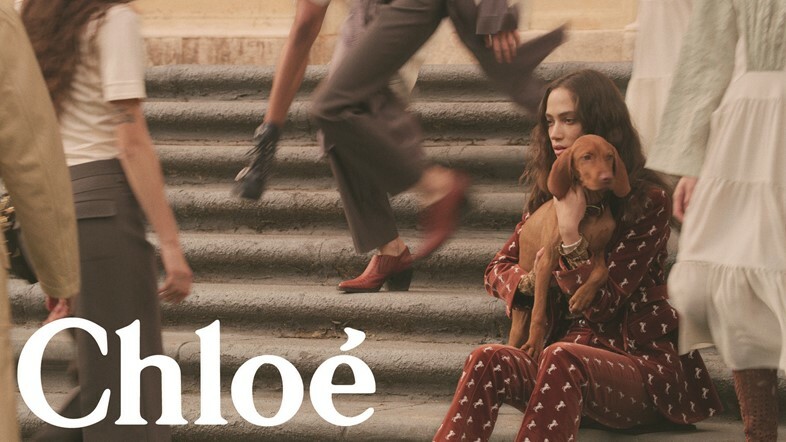 Steven Meisel captures Natacha Ramsay-Levi’s inaugural S/S18 collection for Chloé through a film featuring Sophie Koella, Rianne Van Rompaey, Radhika Nair, Fran Summers, Jing Wen, Alex Mark, Eliza Cummings, Hayett McCarthy, Line Kjaergaard, Makala Johnson and Chalene Hogger. Art directed by M/M Paris – with hair by Guido Palau and make-up by the inimitable Pat McGrath – the subsequent stills that have been released truly capture Ramsay-Levi’s vision for ‘forward-leaning femininity’. That is, injecting a contemporary edge into the classic girlish codes of the French fashion house. 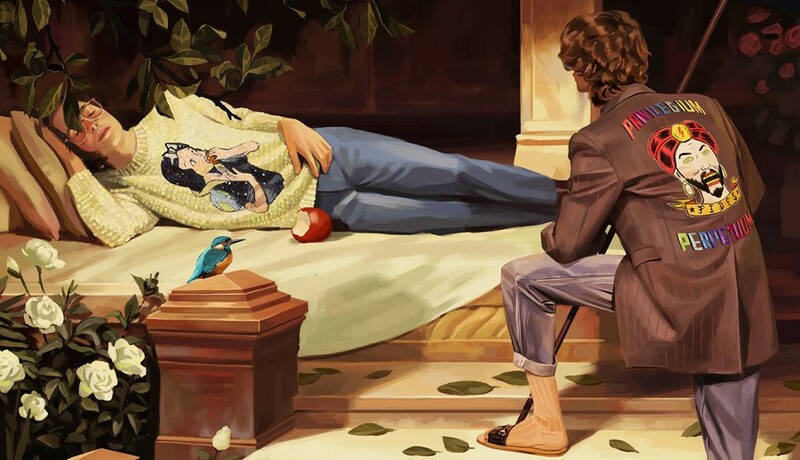 Trust Alessendro Michele to dream up something entirely unique for Gucci’s latest campaign, through a series of digital paintings by Spanish artist Ignasi Monreal. 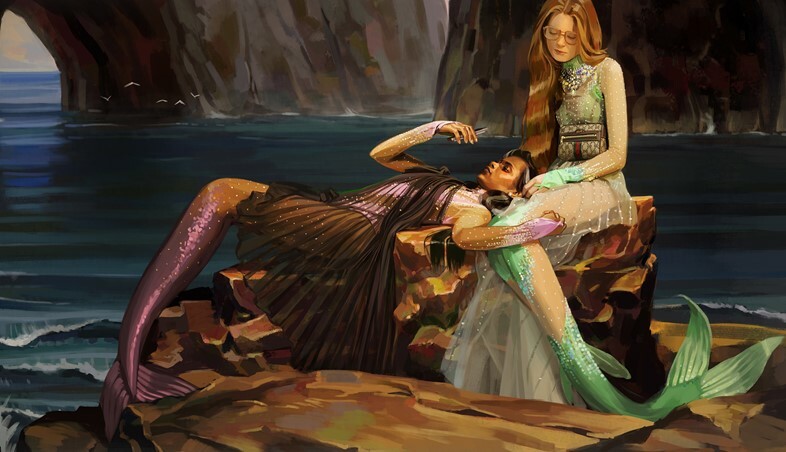 Titled Utopian Fantasy, Michele’s penchant for the Baroque meeting with modernity is pervasive throughout these images, some of which mimic classic artworks – Ophelia by John Everett Millais and Van Eyck’s Arnolfini Portrait, for example – with the models depicted wearing his fantastical S/S18 designs. 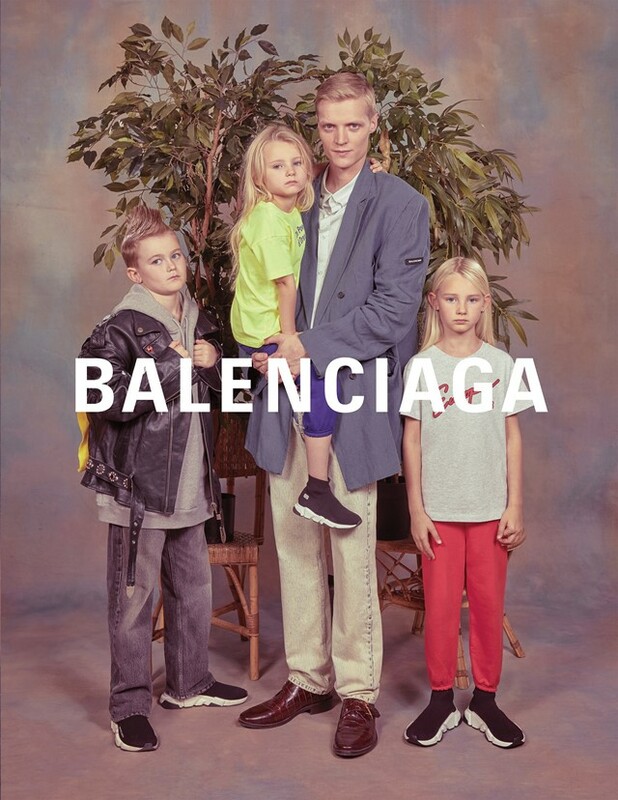 Demna Gvasalia’s ‘normcore’ trope continues in Balenciaga’s S/S18 campaign, with a series of awkward family portraits shot by Robbie Augspurger and styled by frequent Gvasalia collaborator Lotta Volkova. The former is known for his Glamour & Headshots series, which re-created the strange atmosphere of a 1980s photographic studio – a clear inspiration for this campaign. Families and couples stand against the peculiar pastel-hued mottled backdrop, unique to domestic studio photography circa 1992, clad in the designer’s couture take on commonplace clothes. “I want to tell the story of Saint Laurent, of Paris – nothing more deeply than that,” said Anthony Vaccarello of his S/S18 collection for the iconic French fashion house. Naturally, such a story wouldn’t be complete without a heavy dose of 1980s glamour, evidenced in ostrich feather dresses and knee-high boots, ballooning silhouettes in duchesse satin and leather, gargantuan diamanté earrings and sequins aplenty. Vaccarello has tapped into the decade once more with the new campaign film, directed by Inez and Vinoodh. Soundtracked by New Order’s Blue Monday, Anja Rubik, Raquel Zimmermann and Adut Akech dance under neon, coloured lights atop a roof, with Vaccarello’s designs lending themselves to the ambiance of a highly sophisticated nightclub. 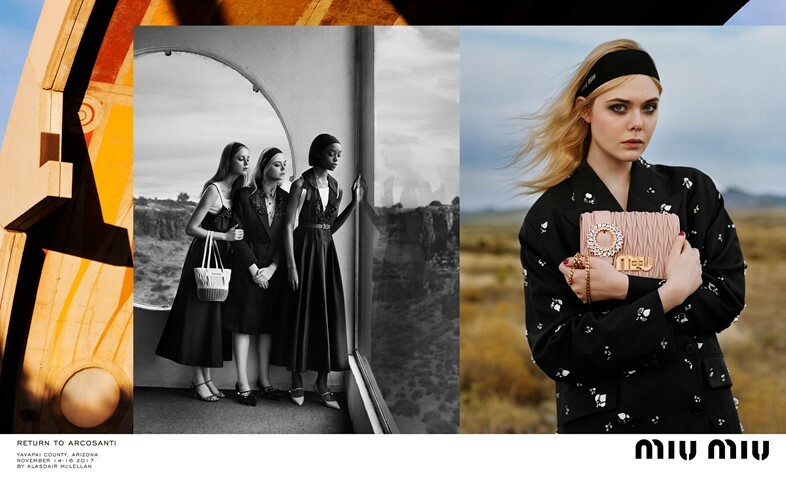 Shot in Arizona, Miu Miu’s S/S18 campaign is titled Return to Arcosanti, where Paolo Soleri’s 1970s architectural project remains almost frozen in time. Soleri’s aim was to improve urban conditions whilst minimising environmental impact – so a backdrop with a social conscience required campaign stars equally engaged in activism. There’s Adwoa Aboah, founder of mental health project Gurls Talk; Cameron Russell, vocal about climate change and maltreatment of models in the fashion industry; and Elle Fanning, active in the gender equality-promoting program REALgirl, to name but a few, all captured by Alasdair McLellan and styled by Katie Grand. Arguably the show of the season, Donatella Versace’s collection to mark the 20th anniversary of the death of her brother Gianni was as moving as it was spectacular. Delving into the Versace archive, the designer resurrected iconic prints, cuts and fabrics, which culminated in a finale featuring Naomi Campbell, Claudia Schiffer, Carla Bruni, Cindy Crawford and Helena Christensen in gold metal mesh gowns. The subsequent campaign by Steven Meisel documents old and new members of the ‘Versace family’, including Crawford’s daughter Kaia Gerber sporting some humongous hair coiffed by Guido Palau. S/S18 was the season of change for Jack McCollough and Lazaro Hernandez, creative directors of New York-based Proenza Schouler; they decided to jump the stateside ship and show their RTW collection in Paris during A/W17 Haute Couture week. Despite the clothes nodding toward many couture signifiers – ruffles, feathers, bustiers – the campaign imagery was paired back to reflect the contemporary Proenza Schouler woman. In this instance, the woman in question was Mariacarla Boscono, shot by Tyrone Lebon, and often wearing very little of McCollough and Hernandez’ designs at all.